Important note: The REGO-FIX Configurator has been optimized for bigger screen. are available with the product search module. Are you sure to restart your product configuration? Are you sure to close the product search? Search your matching toolholding solution. Just select your tool diameter and your machine spindle interface, and the expert search module will match the fitting clamping collets and nuts. Only favorites are available with the expert search function. Please check product pages if you can't find what you are looking for. Choose between standard machining or thread cutting applications. Standard machining means all machining applications, excluding thread-cutting, reaming with floating chucks and toolholders with length compensation. Thread-cutting toolholders, floating chucks and toolholders with lenght compensation can be configurated here. The interface types are dependent on the spindle standard provided by your machine. Several interfaces offer different form variants. Please select the one that fits your machine. Please select your desired interface size. Pick your shank diameter either in millimeters or in inches. Tip: ER collets usually have a clamping range of 1 mm downwards from the nominal shank size. The shorter the stiffer. Longer lenghts are capable to reach more difficult areas in mould and die. Please notice the ultra short ERA toolholders and the XL toolholders with up to 400 mm projecting length. In case your selection is available for more than one system, please choose your preferred tool clamping method. 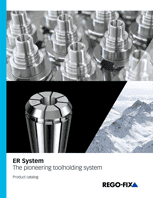 The original ER System by the inventor - a worldwide standard! Our top of the line toolholding system. powRgrip works with press fit technology. Overall system runout convinces with ≤3 μm at 3 x D. Please note that you will need the PG clamping unit PGU or PGC to clamp your tool. 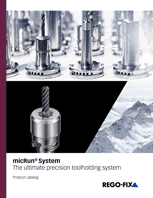 Our high-precision toolholding system which is based on the ER clamping method, but more precise. Overall system runout convinces with ≤3 μm at 3 x D. Please notice that you will need a special AFL-S wrench head. You have selected the ER or MR System. Please choose your thread form. Add additional parts like suitable balancing rings, collets, disks or wrenches to your selection. Don't need additional matching parts? Check out and get a quote for your selection by using the „add selected products to basket“ the right side. Do you want to include balancing rings? All the toolholders marked "H" have the typical "H" grooves for the placement of the balancing rings FWR. Do you want to add a clamping collet? Our toolholders are supplied with a nut, but without a collet. Select your matching collet here. Do you want to add cooling? All REGO-FIX toolholders come with an inclusive standard Hi-Q nut. If you choose a coolant option for configuration, please note that suited cooling nuts must be ordered additionally. Don't have a machine with internal cooling? No problem! Discover how to get internal cooling on your machine. Would you like a bearing version of your additional nut? REGO-FIX toolholders always come with an included standard nut. Do you need a special nut? Do you need a coolant flush disk or a sealing disk with your coolant nut? Create your cooling solution by choosing a coolant flush disk or a sealing disk for your coolant nut. Do not forget to select the matching wrench to safely tighten clamping nuts. Did you know that using the correct wrench increases your tool life and keeps nut runout stable? Below, you will find an overview of your configuration.